I’m extremely jealous of all the adorable fall burgundies, infinity scarves, elbow patches, ankle booties, and plaid that I’m seeing all over Pinterest right now. It’s still summer here in California, and an icy diet coke is one of the only ways I can cool down during a hot day of shopping an the outdoor outlets with my fellow bloggers (who am I kidding, diet cokes will always be on my menu, regardless of the outside chill factor). So we’re still eating refreshing salads up in here! 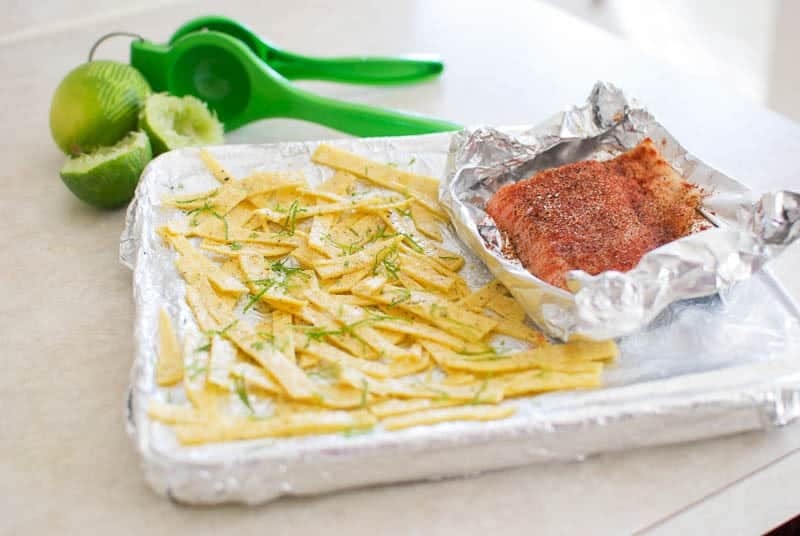 One of my favorite parts is the salty, crisp lime tortilla strips. Takes 2 minutes to prep and 10 minutes to bake…bake it right along with your salmon! 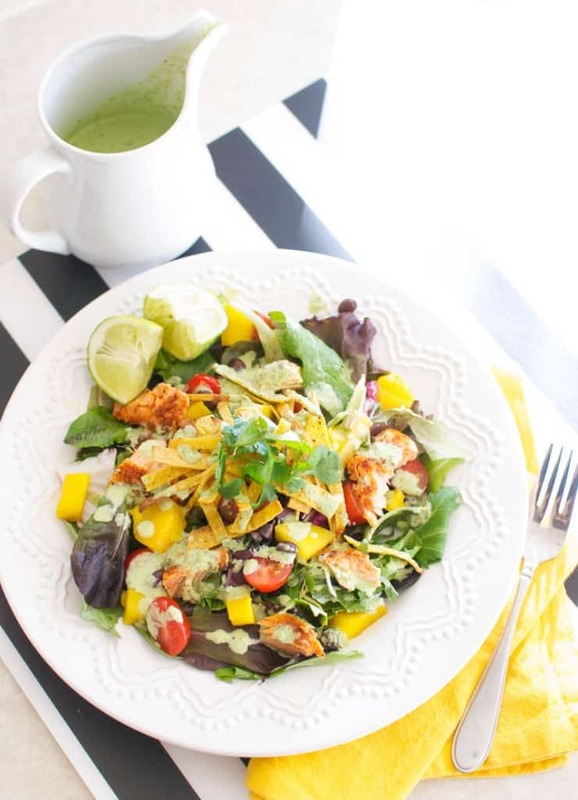 This is the copycat Cafe Rio salad dressing that just about everybody loves. How can you not? We all get nostalgic of our college days, filled with cheap first dates as freshman and Taco Tuesdays! Prep your salmon however you like. Lemon, lime, coconut oil, plenty of spices to give the salad some pop. 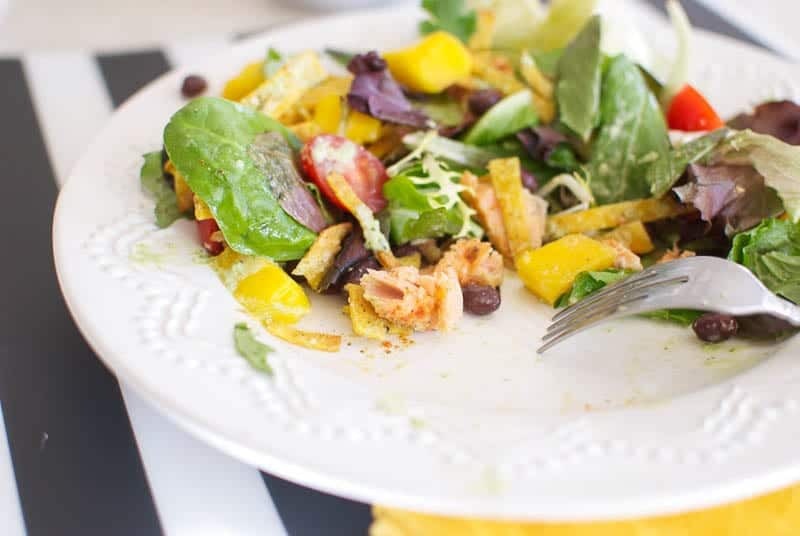 This salad is packed with fiber and protein with the black beans and spicy salmon, all sorts of goodness with the sweet mango and tomatoes, and tiny little red onions balance it all out. 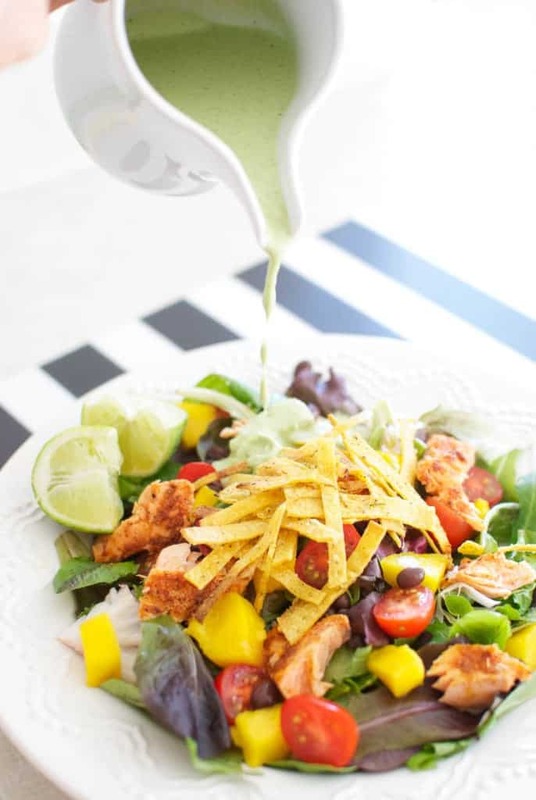 Oh, and the creamy tomatillo dressing and crisp lime tortilla strips make it a Caribbean perfection. 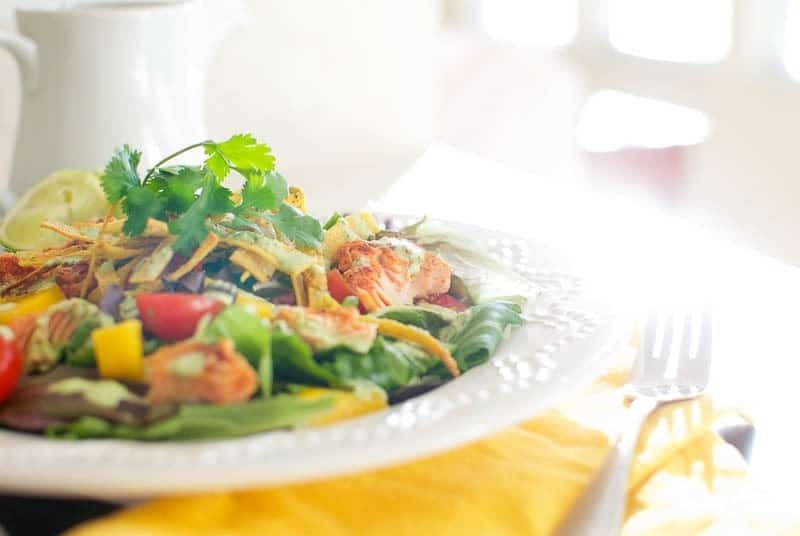 A salad packed with fiber, protein, and all sorts of goodness. Blend all ingredients in blender, chill at least one hour. 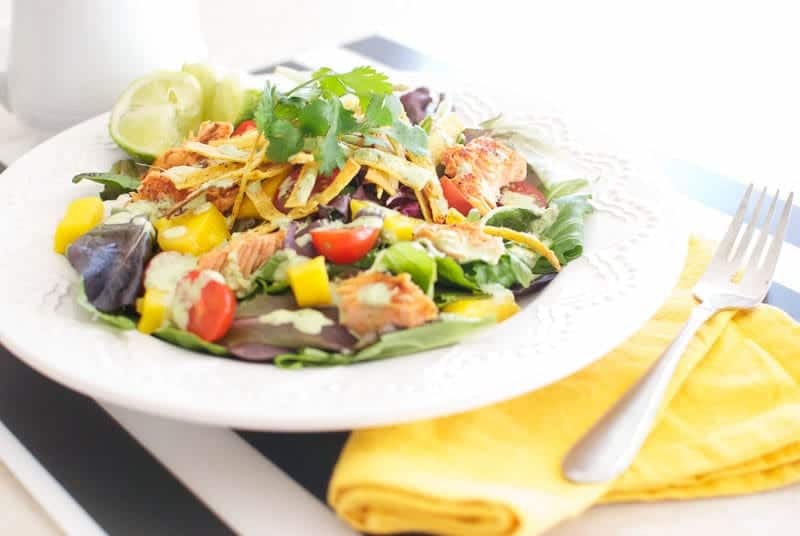 Drizzle salmon filet with lime juice, all spices, and top with coconut oil, melted. Bake as directed, or at 400 degrees for about 10 minutes, or just until it flakes easily with a fork. Preheat oven or toaster oven to 400 degrees. Spray both sides of tortillas with cooking spray and sprinkle with salt, pepper, lime zest, and juice of one lime. Use pizza cutter to cut into strips. Bake about 10 minutes, flipping halfway through. Watch carefully so they do not burn. 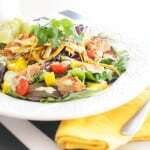 Assemble salad with lettuce, beans, mango, onion, tomatoes, and top with tortilla strips, dressing, and cilantro. I am so much more likely to throw a salad together for lunch if I already have a dressing I love on hand! Make the full recipe for the dressing and you've got so many options! Looks delicious!! I added this to our menu this week! Can’t wait to try it!